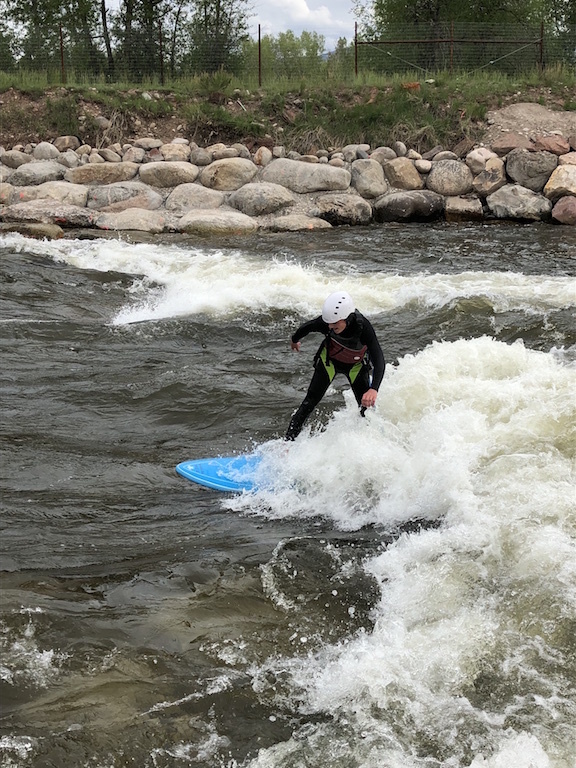 As of the Spring of 2018, the first two drops of the Eagle Whitewater Park are nearing completion, with two more on the way. We haven’t seen a runoff season yet, so we don’t know how the waves surf or what their ideal flow windows are going to look like. Here is how they are planned to look and surf once they’re all finished: Drops 3 and 4 were recently completed, with Drops 1 and 2 on tap for late summer or early fall 2018. Current information suggests 200 cfs or so may be enough to surf a SUP, but may not be enough for shortboards yet. Beyond that, we haven’t seen more flow through the park yet, at least as of this writing (April 3, 2018). I’ll update as we learn more. If you have surf reports, email me. The Eagle Below Gypsum gauge should give the best sense of the flows at the park. As mentioned above, things come to life over 500 cfs, but improve significantly over 1,200. Want flow alerts for the USGS gauge? Sign up here. Parking was part of the park plan. 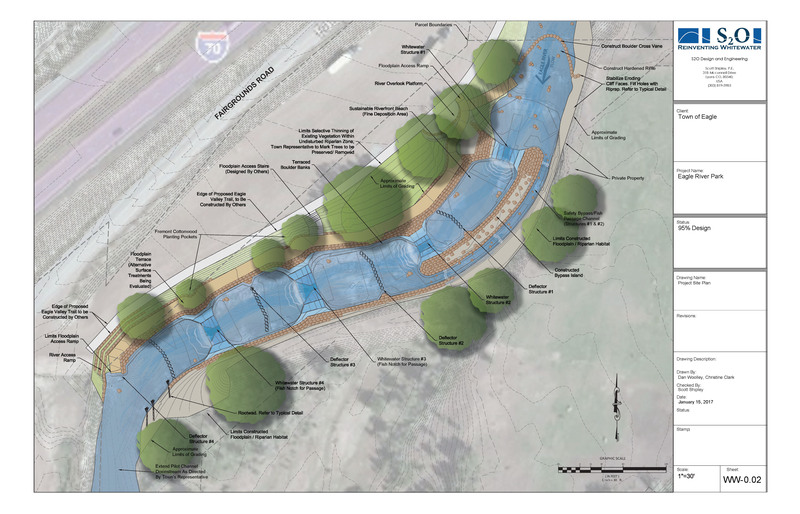 A trail will be built between the Eagle River and east of the rodeo arena for access to parking at the meadow between the Eagle River Center and Fair and Rodeo parking. The Exhibit Hall parking area and Upland Park parking lots will also be increased to accommodate large vehicles. 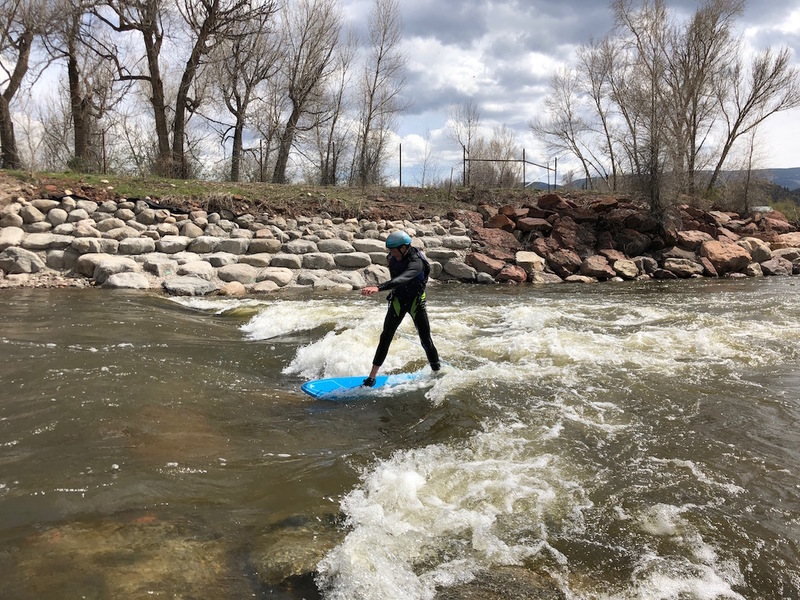 As of April 2018, there is a put-in at the Chambers Boat Ramp, and amphitheater-style access near the Exhibit Hall near the River Center. Construction on the Upland Park (the dry bit) is currently limiting river access in some areas.